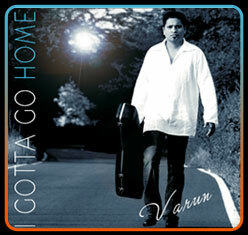 Debut Album "I GOTTA GO HOME"
Taking music production to an all new level, Goa's seasoned talent, Dr. Varun Carvalho today launched his debut album ' I gotta go home' at an exclusive concert at the International Centre, Dona Paula. The album features some of the best musicians in India and is packed with 10 songs to appeal to everyone's listening and dancing taste. "I have always been passionate about music. This album is a dream come true for me. We have worked together as a team on this one and I am fortunate to get the support of some of the best names in the music industry. My music is a subtle fusion of western and classical grooves and I am confident that this will appeal to all."